Now this is a question that has and likely will always cause debate and disagreement. Mainstream science and medicine has always asserted that looking at the sun with open eyes will make you “go blind,” or at best cause damage to your eyes which is bound to cause vision loss from macular degeneration. Even my mother who is a well-respected ophthalmologist holds on to this belief and has always hassled me for my sungazing habits. 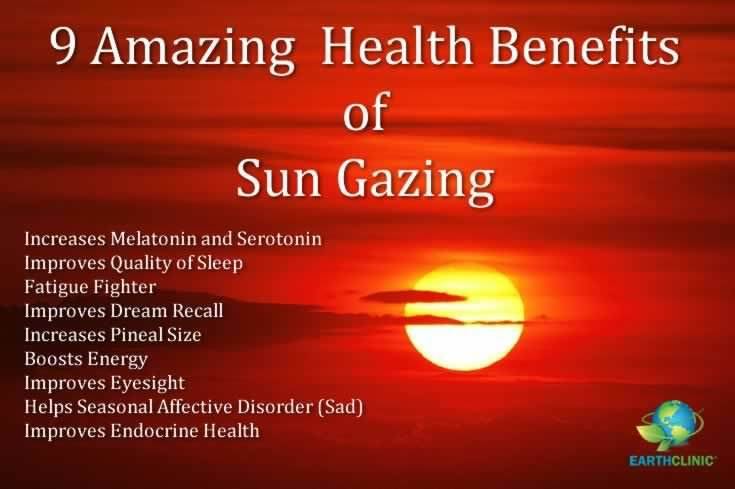 But sungazing enthusiasts claim that these beliefs pushed by mainstream science and medicine are Illuminati/Archon control system lies that are designed to prevent humanity from benefiting from the healthy, consciousness-expanding effects of looking at the sun with open eyes. The idea is that when you look at the sun (which is electrical in nature and NOT powered by nuclear fusion) the electrical energy bypasses your physical body and goes right to your brain to give you the health benefits of sungazing, which include things like increased energy, better mood, decreased appetite from the sun’s energy being converted to essential nutrients, and overall balancing of anything in the body that is “out of balance.” The human body is held together by electromagnetism, so as the theory goes, the sun’s electrical energy is compatible with this and consequently won’t harm the body. But there is just one problem, and that is that in the 2009 documentary “Eat the Sun ,” the character Mason (who looked up to sungazing guru Hira Ratan Manek, aka HRM) has spent time sungazing for a while and then discovered, much to his dismay, that eye doctors who examined his eyes discovered damage which mainstream science and medicine would claim is consistent with looking at the sun and other bright objects for long periods of time. By the end of the documentary, Mason decided to stop sungazing as he felt the damage to his eyes made it not worth it (not to mention that he lost faith in HRM when he was caught eating which proved that his claim that he had abstained from solid food since mid-1995 was a lie.) Interestingly though, HRM had his eyes checked by eye doctors and they found no sign of damage, and his vision was a solid 20/20. How is it possible that HRM could sungaze and not suffer damage, while other folks like Mason are not so lucky? And does the fact that Mason suffered damage show that people like Andrew Bartzis who claim that sungazing does not harm you are wrong? Well folks, there is a simple explanation for why some people like Mason suffer eye damage from sungazing, and that explanation can be shown in four words……. COLLECTIVE CONSCIOUSNESS PLACEBO EFFECT. The fact is, most people in society believe that sungazing would be harmful, and this can cause damage to the eyes of people to sungaze even though sungazing is, in and of itself, a safe practice. Anyone who understands the science of collective consciousness knows that if enough people meditate together with the intent of spreading world peace and love on a global scale, then that group meditation will cause less fear-based and more love-based things to occur on earth. Similarly, if a large group of people were to envision a crop circle of a certain shape and size to appear in a specific place in a field, then the collective belief of those people can cause the creation of that crop circle. Related to this is the “hundredth monkey phenomenon” which says that if a large enough group of people in a society learn and know how to do something, then anyone who enters that society will be able to learn that trait the moment they enter the society without having to be trained or taught the trait. And of course, even mainstream medicine cannot deny that if one believed a fake medicine to be a genuine medicine, then that fake medicine will have the same effect as the real medicine when consumed, showing that the mind and one’s beliefs are the biggest factors in determining a medicine or drug’s effects. So what is the point of all this. Simply put, the reason some people like Mason suffer damage to their eyes from sungazing even though sungazing is supposed to be harmless is because the collective beliefs of the many people in society who have been suckered into thinking sungazing is harmful will inadvertently cause damage to the eyes of those in society who sungaze. This would be especially true if the sungazer in question is surrounded by lots of family, friends, and acquaintances who believe sungazing is harmful as the sungazer is more prone to being affecting by the energies as they are in closer proximity to him. I myself face this dilemma as my ophthalmologist mother and all the many people who believe that she knows what she is talking about are in close proximity to me, thereby making me more susceptible to their false belief energies causing damage to my eyes. I have actually had my eyes checked and like Mason, there are signs of damage. But I have not suffered any loss of vision. Does this mean that sungazing are screwed as the collective beliefs of the many people on Earth who think sungazing is harmful will cause our eyes to become damaged? Thankfully, the answer is NO. Where am I making is assertion? Well, believe it or not, just six hours after I had my eyes checked and found that sungazing had caused damage to my eyes, I listened to an interview that Andromeda Council contactee Tolec did with an Arcturian contactee named Sheri who did healings and offered remedies to a woman with macular degeneration who was about to lose her sight, and because of the healings and remedies the woman did not lose her sight and her ophthalmologist cannot believe that she hasn’t lost her vision, all because she BELIEVED that the healings and remedies would prevent her vision from going away. Personally, I took this as a sign that the universe was trying to tell me, “Don’t worry about what that ophthalmologist who checked your eyes six hours ago saw. It is of no concern. Your eyes will not lose sight if you believe that you won’t.” What a shame that my dear sweet mama doesn’t share this opinion.